Contributors. Preface. 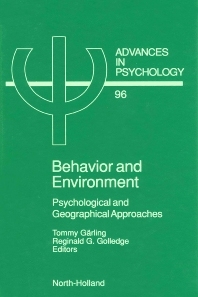 Understanding Behavior and Environment: A Joint Challenge to Psychology and Geography (T. Gärling, R.G. Golledge). Part I. Basic Processes of Behavior-Environment Interaction. Geographical Perspectives on Spatial Cognition (R.G. Golledge). Psychological Perspectives on Spatial Cognition (T.P. McDonald, J.W. Pellegrino). Emotions in Person-Environment-Behavior (D. Amedeo). Environment Appraisal, Human Needs, and a Sustainable Future (R. Kaplan). Cognitive Processes and Cartographic Maps (R. Lloyd). The Structure of Cognitive Maps: Representations and Processes (S.C. Hirtle, P.B. Heidorn). Hazard Perception and Geography (R.E. Kasperson, K. Dow). Perceptions of Environmental Hazards: Psychological Perspectives (P. Slovic). The Geography of Everyday Life (S. Hanson, P. Hanson). Psychological Explanations of Participation in Everyday Activities (T. Gärling, J. Garvill). Part II. The Real-World Contexts of Basic Processes of Behavior-Environment Interaction. Search and Choice in Urban Housing Markets (W.A.V. Clark). The Choice of a Home Seen From the Inside: Psychological Contributions to the Study of Decision Making in Housing Markets (H. Montgomery). Retail Environments and Spatial Shopping Behavior (H. Timmermans). Consumers in Retail Environments (P.M.W. Hackett, G.R. Foxall, W.F. van Raaij). Human-Nature Relationships: Leisure Environments and Natural Settings (J.J. Pigram). Psychological Foundations of Nature Experience (T. Hartig, G.W. Evans). Author Index. Subject Index. Active researchers in the areas of geography and psychology have contributed to this book. Both fields are capable of increasing our scientific knowledge of how human behavior is interfaced with the molar physical environment. Such knowledge is essential for the solution of many of today's most urgent environmental problems. Failure to constrain use of scarce resources, pollution due to human activities, creation of technological hazards and deteriorating urban quality due to vandalism and crime are all well known examples. The influence of psychology in geographical research has long been appreciated but it is only recently that psychologists have recognized they have something to learn from geography. In identifying the importance of two-way interdisciplinary communication, a psychologist and a geographer have been invited to each write a chapter in this book on a designated topic so that close comparisons can be drawn as to how the two disciplines approach the same difficulties. Since the disciplines are to some extent complementary, it is hoped that this close collaboration will have synergistic effects on the attempts of both to find solutions to environmental problems through an increased understanding of the many behavior-environment interfaces.